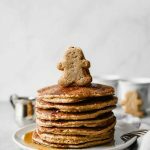 Sweet, wholesome, Healthy Gingerbread Oatmeal Pancakes recipe that’s perfect for this holiday season! Made with rolled oats, yogurt, and banana (gluten free). Serve for holiday brunch or freeze for easy breakfast meals throughout the week! Pancakes are always a big win for me. Because, pancakes, of course! But I especially love them when they’re healthy and loaded with holiday flavor! Making these for brunch? Be sure to decorate them with these homemade Healthy Gingerbread Cookies! Things I love about these Gingerbread Oatmeal Pancakes: they’re thick, fluffy, soft, wholesome, and sweet. Not to mention gluten-free! These Healthy Gingerbread Oatmeal Pancakes are incredibly easy to make! Simply blend the rolled oats (or purchase pre-made oat flour), add in the rest of the ingredients, and cook each pancake for about 5 minutes! You guys are going to love this recipe! Enjoy, friend! Sweet, wholesome, Healthy Gingerbread Oatmeal Pancakes Recipe that's perfect for this holiday season! Made with rolled oats, yogurt, and banana (gluten free). Serve for holiday brunch or freeze for easy breakfast meals throughout the week! Blend the rolled oats. Add in the liquid ingredients and continue to blend. Add in the remaining ingredients and blend until the batter is even throughout. Pour 1/4 cup of the batter into a hot pan and cook for about a minute on each side (or until browned). Top with pure maple syrup and enjoy! Yep for sure too early (Thanksgiving is my favorite holiday) but regardless these sound super yummy! 8 life pancakes! I love the new look of your blog! Well done girl!